Select an object type from the list below. Certain object types (including architectural terracottas, coins, pottery, sculpture) include subtypes (shape and ware of pottery, denomination and mint of coins) to refine your search. Select a material from the list below. Select a museum from the list below. Select a Sardis CATNUM from the list below. CATNUM is made up from object type, year, and sequential number. BI = Bone Implement; G = Glass; J = Jewelry; L = Lamp; M = Metal; NoEx = not excavated; Org = Organic; P = Pottery; S = Sculpture. Coins are numbered with the year of discovery and a running number, or year, C, and a running number. Select a historical period from the (alphabetical) list below. Select the language of inscribed texts from the list below. Select a site from the list below. Ahlatlı Tepecik Basmacı Tumulus Düver Ephesus Gordion Gökçeler Gökçeler? Haliller Ikiztepe Tumulus Kelainai Miletus Old Smyrna/Bayraklı Sancaklı Bozköy? Sardis Toptepe Tumulus Turgutlu? Şahankaya? The stratigraphic contexts (findspots) of artifacts from Sardis are recorded at different levels of specificity. Sector is the most general, referring to a broad area of the city. Trenches are yearly excavation areas (in current usage) or more specific areas of sectors (in early records which used a different excavation system). A Locus is a single stratigraphic unit, i.e. a single deposit of soil, a destruction level, a grave, a dump or other deposit. For instance, MMS-I 84.1 Locus 34 is the destruction level from a Lydian house just inside the fortification wall in sector MMS, containing a rich deposit of Lydian pottery and other artifacts. Note that loci can be continued over a number of years, and so belong to different trenches, if the same stratigraphic unit is excavated over a number of years. For a list of sectors see Hanfmann and Waldbaum, A Survey of Sardis and the Major Monuments Outside the City Walls (Sardis R1, 1975), 13-16. Bar of very fine black stone, rectangular in section, broken at one end, other end finished. Polished smooth surface, slightly convex. Preserved length 0.052 m, width 0.012 m; thickness 0.010 m.
Electrum third-stater. Obverse: roaring lion head, facing right, with “hairy nose wart.” Reverse: two incuse punches. Good condition. Weight 4.75 g, diameter 12 mm. Electrum third-stater. Obverse: roaring lion head, facing right, with “hairy nose wart.” Reverse: two incuse punches. Good condition. Weight 4.75 g, diameter 11 x 13 mm. Electrum coin of twelfth-stater weight. Obverse: Roaring lion head facing right. Along right side of coin, three Lydian letters, “...WET.” Reverse: single punch. 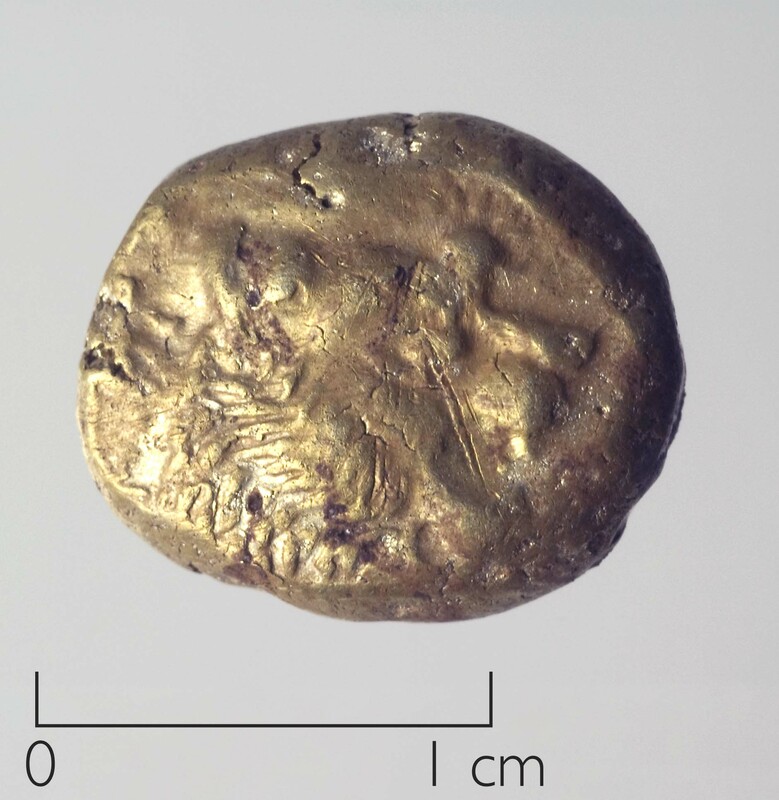 Diameter 0.007; weight 1.19 g.
Electrum Third-Stater with Lydian Inscription, “kukalim”? Electrum coin of one twenty-fourth stater weight (Ephesus Excavations Inventory ART 94/K277). Obverse: four-clawed lion’s paw. Reverse: single punch. Weight: 0.56 g.
Eighteen electrum coins of twelfth-stater weight (Gordion inventory Nos. 1105-1122). Obverse: roaring lion head facing right. Reverse: single punch. Countermarks on Nos. 1105, 1120-1122. Weight 1.20 g.